Of the top 10 markets with the most single-family construction activity over the last year, six are located in Texas and the Southeast. The ranking table below shows the top 20 markets in the country. 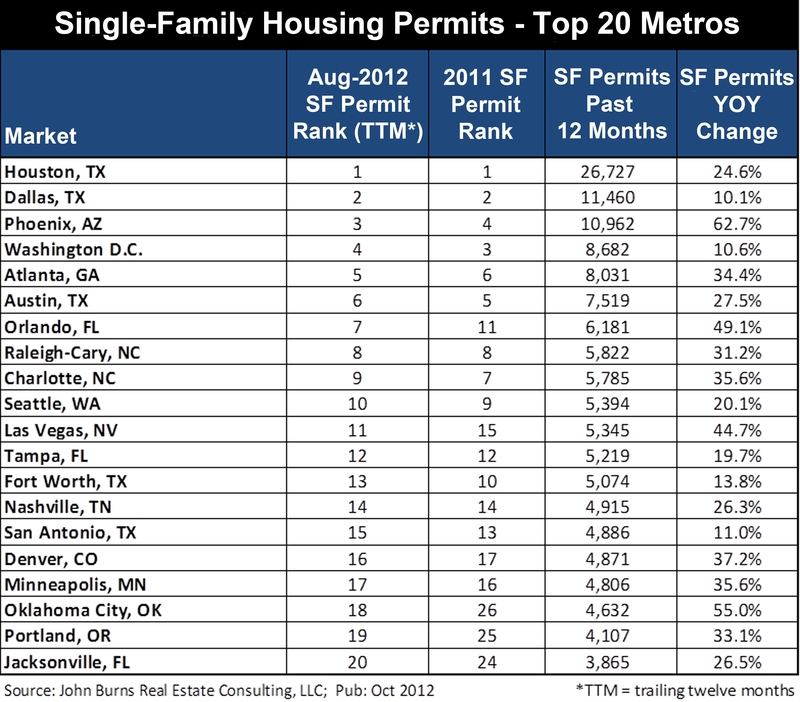 We have ranked them in order of the total number of single-family permits pulled over the last 12 months. Tracking metro-level permit trends gives insight into which housing markets are growing and by how much. Houston, driven by strong job growth, a growing population and an accommodating building environment, has seen more than twice the amount of permit activity than 2nd ranked Dallas. Eighth ranked Raleigh, which has one of the smallest populations on the list, is now ranked one spot ahead of its vastly more populous neighbor Charlotte. All of the top 20 markets have seen sharp growth in new home construction activity, with Phoenix leading all metros with a 63% YOY jump. 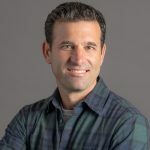 Builders in Phoenix are scrambling to keep up with a recent surge in demand brought on by low resale supply, a surge in investor activity, rising prices, and strong job growth. Orlando and Oklahoma City have also experienced a staggering increase in new home construction, with YOY growth of 49% and 55% respectively. Surprisingly, there are no California markets currently ranked in the top 20 for permit volume. Most California markets are supply constrained with typically long lead times to open new communities. Riverside-San Bernardino, which is currently the largest California market for single-family construction, has seen negative permit growth and dropped to 26th in the rankings from 20th at the end of 2011. Single-family permit growth has generally been highest in metros that have experienced the strongest job growth, which is what we would expect as improvement in employment is a key indicator of future housing demand. 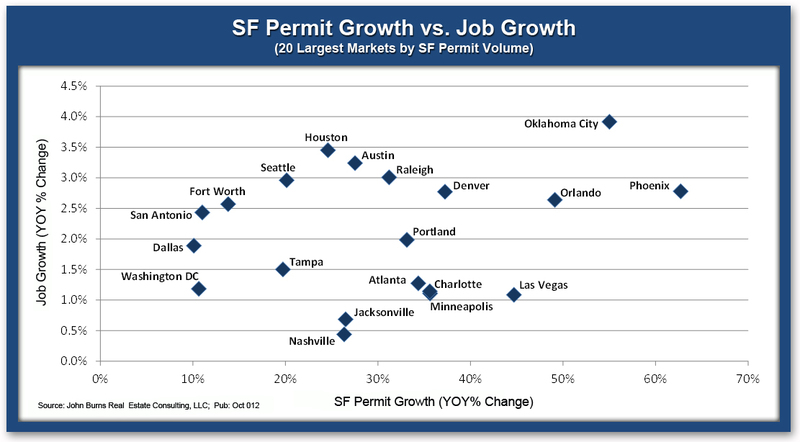 The chart below displays just how much single-family permit activity has surged in comparison to job growth for the top 20 markets. Along with very strong permit growth, Oklahoma City, Orlando and Phoenix have all experienced job growth over 2.5% YOY. However, construction activity has also surged in markets with relatively weak job growth, including Las Vegas and Jacksonville. Even though the economy remains sluggish in these markets, considerable pent-up demand and improving housing fundamentals are spurring construction. Lackluster job growth, along with a degree of political uncertainty leading up to the election, has contributed to somewhat limited permit growth in Washington DC. Previously oppressed markets, like Orlando and Las Vegas, are starting to emerge as hotbeds of construction activity. However, strong increases in permits paired with shrunken construction employment are creating unpredictability, including spotty labor shortages in some markets. Closely monitoring market trends in today’s rapidly changing housing market, where conditions vary significantly by metro, can help identify where the next Phoenix will be.